Some of the Eqyss products have recently had their labels, ingredient wording, and order of ingredient listing changed. This has caused speculation that the products are not the same and/or are not as effective as they used to be; however this is not true. Eqyss products have NOT changed their ingredients for over 21 years. The wording was changed to facilitate sales in international markets and the order of ingredient listing was changed to reflect the amount of the ingredient relative to other ingredients. Eqyss has published a letter explaining this, which you can view by clicking here. 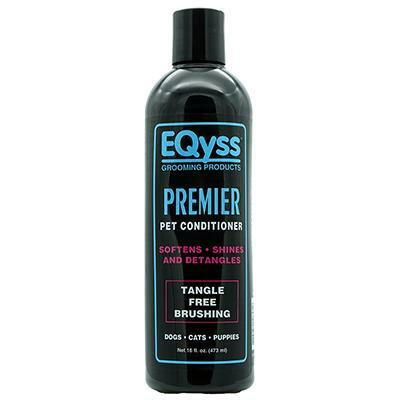 EQyss Premier Cream Rinse Conditioner and Detangler (Formerly Known As, Cloud Nine), is a unique product developed specifically to condition rough, dry, brittle hair and make tangles disappear. Brushing will be tangle free. A rich combination of natural emollients minimizes flyaways and smoothes hair cuticles to replenish each strand, leaving hair soft and tangle-free. Completely safe for human cross-over use. 16 oz bottle. Formerly Known As, "Cloud Nine"
deionized water, behentrimonium methosulfate, cetrimonium chloride, dimethylamino propylamido PCA, hydroxyethylcellose propylparaben, DMDM hydantoin, aloe barbadensis, vanilla planifolia extract, sweet almond extract, fragrance.